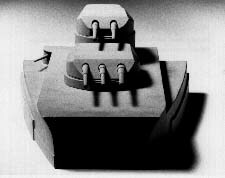 Demonstration model of the forward turret group. Photographs copyrighted by Erwin F. Sieche and used here by his permission. Intended for the Ersatz Monarch (improved Tegetthoff) battleships, these guns were used as land artillery when those ships were cancelled. The Austro-Hungarian Navy drew up the first specifications for these battleships on 3rd June 1911. The Marinetechnische Komitee or MTK (Naval Technical Committee) presented two series of designs: A 21,650 ton (22,000 mt) warship with 30.5 cm (12") guns and a 23,000 ton (23,400 mt) ship with 34.5 cm (13.6") guns. In February and March 1912, the Navy made a series of displacement calculations with different armament and belt armor. Beside the 34.5 cm caliber, the Navy studied the possibility of introducing the 35.5 cm (14") caliber and ordered Škoda to work on a design for turrets for this caliber with any-angle loading, similar in concept to contemporary British designs. On the basis of these calculations, on 11th March 1912 the Navy drew up new specifications for the battleships. On 1 April 1912, Škoda submitted drawings for 34.5 cm (13.6") twin and triple gun turrets to three shipyards and to the MTK, but the 35.5 cm (14") drawings were not finished in time. 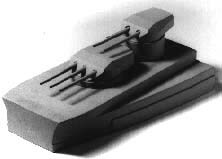 These 34.5 cm (13.6") turrets were poorly protected and they had a complicated design, due to the any-angle loading system which was more complex than those on British battleships. The shipyards and the MTK presented a total of 25 battleship designs ranging from 23,000 to 26,600 tons (23,400-27,000 mt) and armed with eight to thirteen 34.5 cm (13.6") guns. On 25th June 1912 a board headed by Vice-Admiral Karl Kailer von Kaltenfels reviewed these designs and found them unsatisfactory. The board decided to instead pursue a new design for a battleship of about 24,100 tons (24,500 mt) armed with ten heavy guns. The board decided that these guns would be yet another new size, 35 cm (13.8"), and that they would have a simpler, fixed loading angle. In July 1912 the Navy asked Škoda to work out the designs for 35 cm (13.8") twin and triple turrets. The first tests with Rohr Nr. 1 (Barrel No 1) were executed in Pilsen on 20-21 November 1914. During the tests, the gun fired eight 1,400 lbs (635 kg) projectiles at muzzle velocities between 2,687 and 2,700 fps (819 to 823 mps). The test committee recommended reducing the muzzle velocity down to 2,625 fps (800 mps) in order to reduce wear and improve barrel life. Actual bore size was 349.5 mm (13.76"). Recoiling mass was 166,000 lbs. (75,300 kg). ^Projectiles were all 5.25crh and at least the APC and HE used both armor piercing and ballistic caps. ^The Main charge held 344 lbs. (156 kg) of propellant while the Fore charge held 108 lbs. (49 kg). It is noted that the propellant tubes for these charges were longer and thicker than those used for the 30.5 cm guns. ^Forward charge was in a thin brass casing which burned during firing. The forward charge had a 50 gm igniter at both ends. The main charge was in a thicker brass casing and had a 250 gm igniter. This casing weighed 172 lbs. (78 kg) empty. ^One gun used as land artillery fired 122 rounds before needing to be relined. ^12 practice rounds per gun were to be carried. These values are based upon theoretical calculations performed in July 1913 and do not reflect actual trials. Armor type is unknown. The four turrets would have been all-electric operated, fed by 6×250 KW turbine-driven dynamos. On the evidence of few drawings and documents, it seems that the ammunition supply would have been similar to the contemporary German turrets. 35 cm APC Projectile. Note the wood "shock absorber" at the top of the burster. Photograph copyrighted by Mihály Krámli and used here by his permission. Two 35 cm HE Projectiles. Note the wood "shock absorber" at the top of the burster. Photograph copyrighted by Mihály Krámli and used here by his permission.